Now you can own a cool Seinfeld Cast Squares T-Shirt. If you like the classic comedy show Seinfeld and Warhol then this shirt could be just what you always wanted. 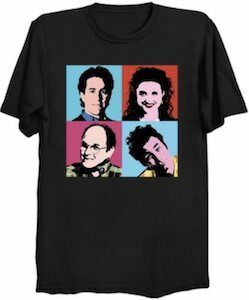 The shirt shows four colored squares just like we know from the Warhol art work only this time it has the four main cast members of Seinfeld inside it. Jerry, Elaine, George, and Kramer are all there and that makes this a cool shirt. You can get this Seinfeld t-shirt in sizes Small – 6XL and comes in styles for men and women. Wear this t-shirt to show the world that you didn’t forget about Seinfeld and his friends.